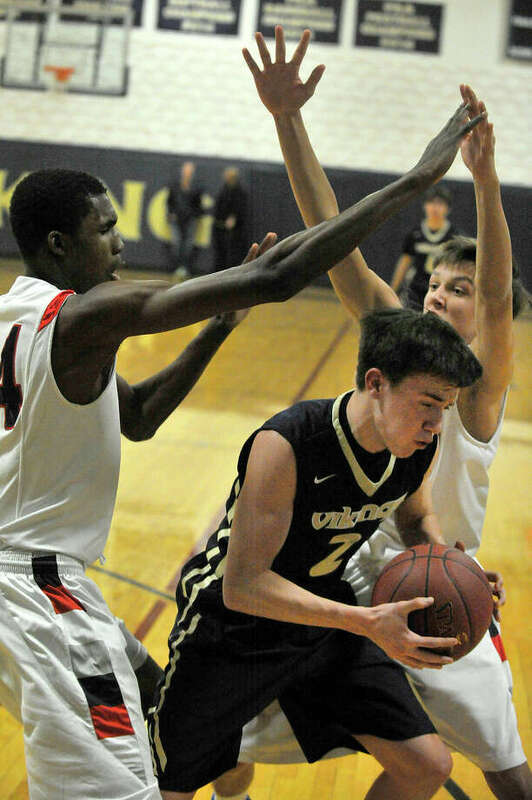 King's Eddie Meizels is double-teamed by Greens Farms Academy's Zach Baines, left, and Henry Holzinger during their basketball game at King School in Stamford, Conn., on Thursday, Jan. 15, 2015. GFA won, 81-63. STAMFORD -- The resume of the Greens Farms Academy boys basketball program is known far and wide throughout New England. The Dragons' FAA and NEPSAC success speaks for itself. The result is a huge bull's eye on GFA's back. Right now, these current Dragons aren't quite as fierce as the old Dragons. Still, GFA was able to overcome the hightened emotional state of King School Thursday night and bus home with an 81-63 road triumph. "Every night this season has been a challenge," GFA coach Doug Scott said. "Every team is bringing their best effort to us. It is a fun challenge." The challenge has not been without obstacles and bumps in the journey as GFA improved to 5-6 overall and 3-4 in the FAA. Injuries have kept GFA from playing a full roster most nights this season. The Dragons' 6-foot-7 sophomore center Sunday Okeke of Darien missed all of December with back issues. Newcomer junior forward Chile Larraguibel of Greenwich has also been in and out of the lineup. The lack of time together on the court -- both in games and in practices -- shows. "What you need to know about Sunday (Okeke) is this is just his second full season playing basketball," Scott said. "His body is certainly built for basketball. Time and experience will launch his improvement." At 6-foot-7, Okeke is a force in the paint in the FAA. Playing limited minutes due to fouls and player rotations, Okeke still finished with a game-high 25 points and 20 rebounds. What GFA does lack is depth in scoring options. Senior forward Zach Baines of Stamford -- a McDonald's High School All-American nominee who has committed verbally to Middlebury College -- used speed, quickness and hops to collect 15 points and 14 rebounds Thursday. The glue for the Dragons is senior guard Jim Djema of Greenwich, who registered 17 points, four steals and four assists in limited minutes. An X-factor going forward for GFA is Larraguibel, who did drive effectively to the hoop while chipping in 10 points. "We're blessed to have Chile. He is a good outside shooter as well," Scott said. "He probably doesn't get as many touches because when Sunday gets going our focus is to get the ball inside." Scott substituted liberally Thursday since the Dragons were coming off a double-overtime loss to Masters Tuesday night. GFA opened up a 22-8 edge early in the first half then closed with an 8-0 surge for a 44-26 halftime advantage. King pulled within 61-50 with 7:16 left to play, but GFA responded with a 9-2 run that settled the issue at 70-52 with 5:00 remaining. "We've lost a lot of close games at the end. Some of that was due to our injury status," Scott said. "It would be nice to have a few more wins on our ledger. But if we continue to improve, no team will want to face us in February." For King (1-7, 0-6 FAA), guard Eddie Meizels poured in a team-high 21 points followed by Trey Canaveri (14 points, four 3-pointers), Chris Massucco (12 points) and Brad Sherwood (11 points, all in 2nd half). "I thought we played as hard tonight as we have all season. Okeke is hard to stop period in the paint," King coach Greg Dobbs said. "The coaching staff is asking the kids to play hard and play a little smarter. Competing as we did tonight was good. GFA has been impressive for years. You can see how good they can be when they get all their pieces together on the floor." Zach Baines 7 1-2 15 Sunday Okeke 10 5-9 25 Pat Seegers 1 1-4 3 Jim Djema 7 2-2 17 Chile Larraguibel 2 5-6 10 Henry Holzinger 1 0-0 2 Dugald Shannon 1 0-0 2 Jacob Manton 1 0-0 3 Evan Roteman 1 2-3 4 Mack Muller 0 0-1 0. Totals: 31 16-27 81. Chris Massucco 6 0-0 12 Matt Sherwood 2 6-8 11 Trey Canaveri 5 0-0 14 Eddie Meizels 8 3-5 21 Peter Horn 1 0-0 3 Cris Trump 0 0-0 0 Christian Watanabe 0 0-0 0 Jake Spencer 0 0-0 0 Renn Lints 1 0-0 2 Jackson Trimmer 0 0-0 0 Jamie Schwartz 0 0-0 0. Totals: 23 9-13 63. 3-Pointers: GFA -- Djema, Larraguibel, Manton. K -- Sherwood, Canaveri 4, Meizels 2. Highlights: GFA -- Okeke 20 rebounds.